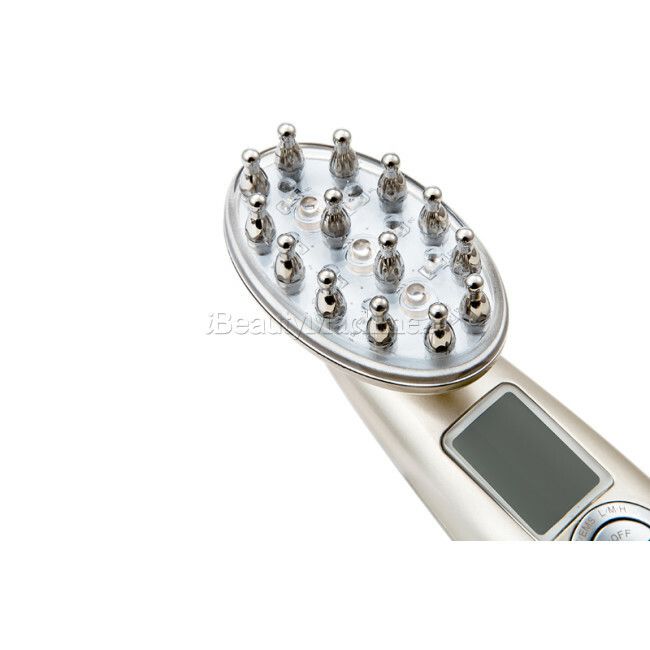 Generates 650nm low level laser energy which stimulates hair follicle, activate the atrophic scalp cells, balance bio-energy and improve metabolism. 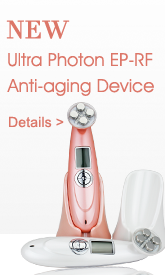 Micro-current energy effectively activates cells and accelerate generation of hair follicle. High power LED light consists of six color light wavelength which promotes the detachment of dead cells and regeneration of new cells. Innovative soft laser stimulate hair follicle, activate the atrophic scalp cells, balance bio-energy and improve metabolism. 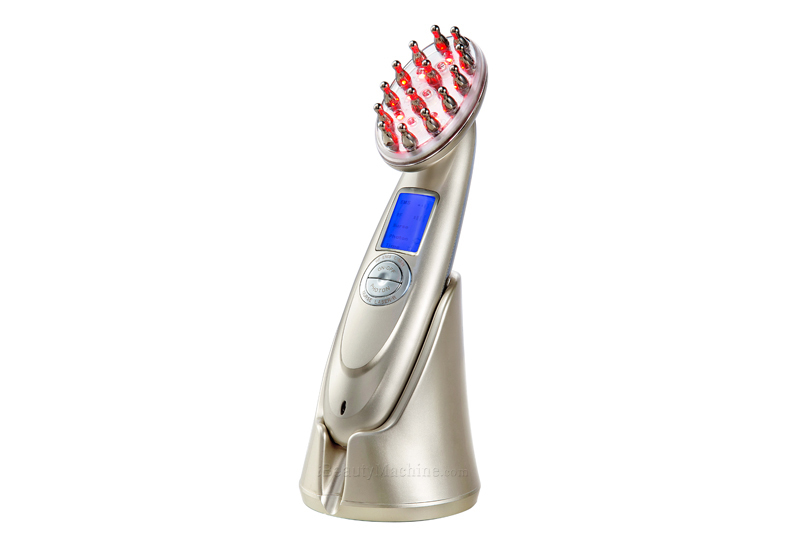 The 5 in 1 laser hair restoration comb adopts the latest soft laser technology (650nm), Micro-current, RF, Ozone and high power RED LED light therapy. How does laser work for hair re-growth? The comb stimulates the scalp by RF and microcurrent to dredge blocked pore activate the hair follicle in dormant state which helps to complement hair nutrition and consolidate the hair root. Micro-current energy is a low-frequency electric pulse. It effectively activates cells and accelerate generation of hair follicle. With the 5 powerful technologies, the hair-growth nutrition absorption is greatly improved. Meanwhile, constant massage and pat of scalp accelerate the blood circulation of capillary vessel and enhance permeability of cells to supply the nutrition to the musculature and skin more effectively. With the laser energy, the increase in blood flow brings the important nutrients into the follicle, while taking away harmful waste products such as DHT. The increase in ATP increases cellular metabolism and cellular activity. 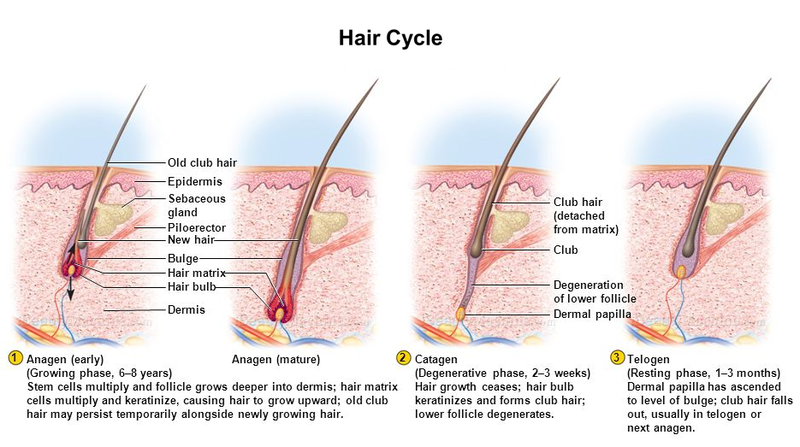 As a result, the regeneration of hair follicle is achieve, which will produce healthier hair, prevent further hair loss, and stimulate hair growth. Within the first 5 to 10 weeks, you should notice early general improvements. There may be a short period of shedding during the first 2 to 4 weeks. This is to be expected. Improvements seen should include noticeably shinier, fuller hair, and a thicker overall appearance. New hair growth takes more time. Typical results just begin to show at the 6 months’ mark, and should continue to improve and then plateau at the 2-year mark. 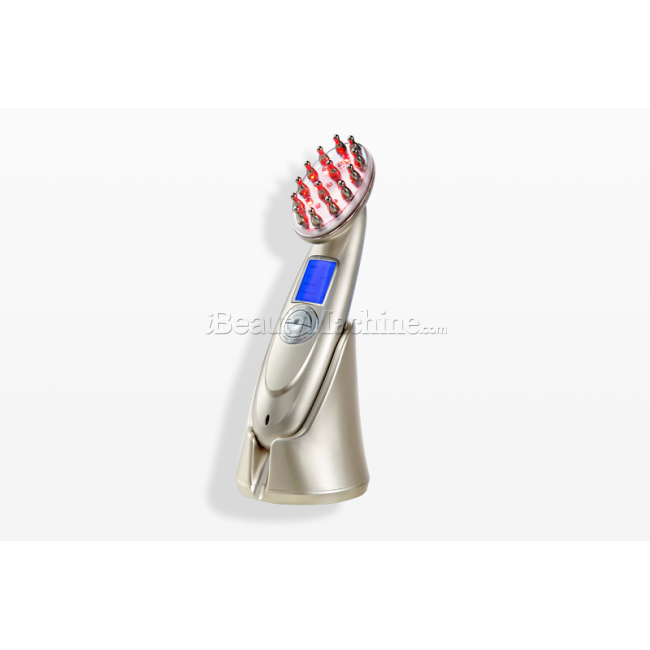 The laser hair loss cure comb must be continued in order to maintain any results achieved. Just like we brush our teeth to avoid tooth decay, and shower and shampoo daily, we must care for our hair daily to keep it strong and healthy. Following is the real BA photos from oru costomer, thanks very much. 1. After 4 months treatment on a 50-year-old male. 2. After 12 weeks treatment, the hair is much denser and fuller. 3. After 6 mongths treatments. 1. How often do I need to use the Laser Hair Restoration Comb to treat my hair loss? We recommend that the Laser Hair Restoration Comb can be used 3 times per week, 8-15 minutes per hair loss treatment for optimal results. You cannot use the Laser Hair Restoration Comb more than three times a week to see faster results. We have found that three times a week seems to be the optimal amount of usage. 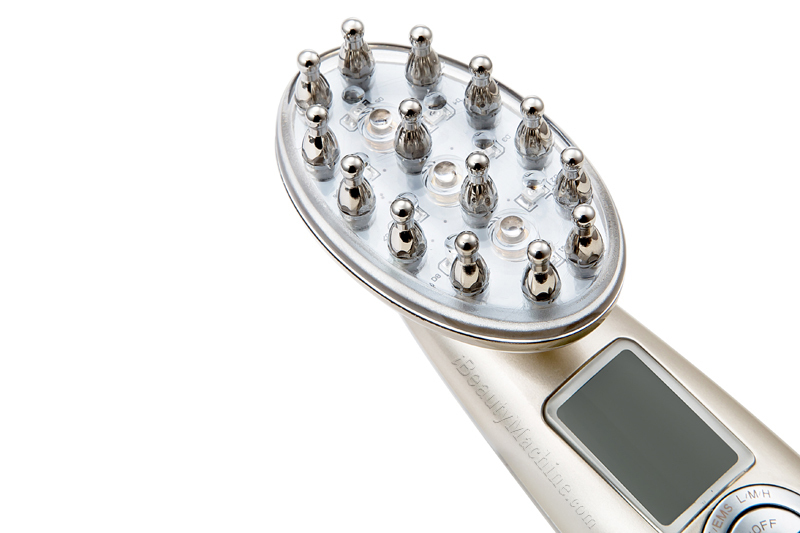 Using the Laser Hair Restoration Comb more than three times a week has not been shown to accelerate the benefits. 2. When can I expect to start seeing results from the Laser Hair Restoration Comb? Many users will see positive results after 8 weeks of treatment. More will see benefits from weeks 10-16. A small minority of users will begin to see subtle improvements (if any) after 16 weeks. 3. Does hair loss treatment with the Laser work on the entire head or only on the back? The Laser Hair Restoration Comb may improve the appearance of the entire head: back, front, top and sides. 4. Can people of all ages with hair loss benefit from using the Laser Hair Restoration Comb? Studies have shown that laser phototherapy (LPT) is effective in people ages 18 and older. For people under the age of 18, we recommend you consult your physician prior to using the Laser Hair Restoration Comb. 5. 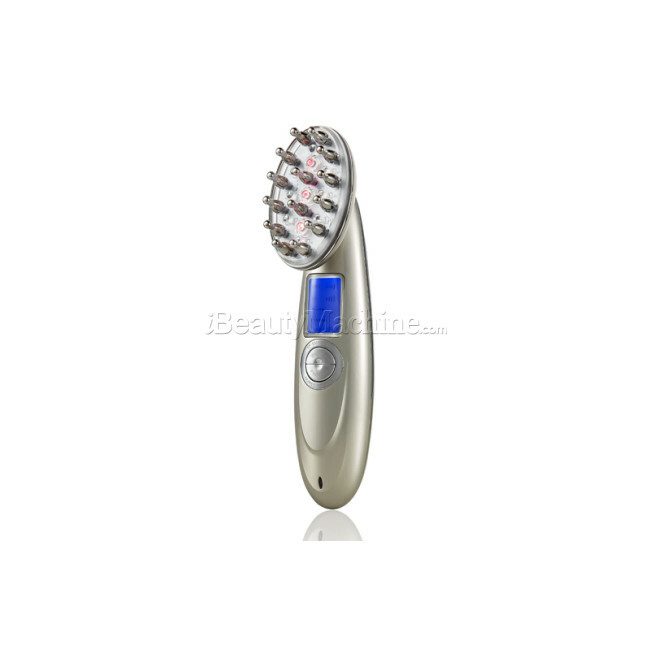 Does your hair need to be clean to use the Laser Hair Restoration Comb? We do recommend that you use the Laser Hair Restoration Comb on a clean scalp so that the laser can effectively improve the appearance of your hair without being hindered by oils, dandruff, etc. The reason for this is to prevent product buildup from blocking the laser light. However, you can also address this by cleaning your laser comb with a damp cloth before and after each use. 6. Is the Laser Hair Restoration Comb safe to use? In clinical studies and in general use since 2005, there has never been any report of serious adverse events occurring. 7. Can the Laser Hair Restoration Comb affect my hair in a negative way? 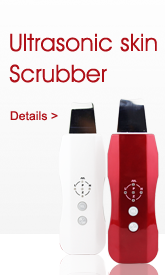 No serious side effects have ever been reported from use of the Laser Hair Restoration Comb. 8. How long has the Laser Hair Restoration Comb been on the market? 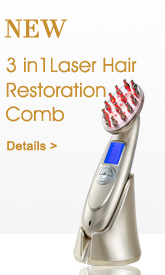 The Laser Hair Restoration Comb has been on the market since July 2005. Since this time, we have been extremely encouraged and excited by the large amount of positive press our product has received. It's hard to say a specific result. The result depends on different people. And for better result. you'd better use some medical liquid which help hair regrowth. Quiero saber como utilizarlo pues las instrucciones no son claras está la opción de masaje, laser, red pitón. De o utilizar todas las opciones? Lo puse a cargar y continúa en rojo debo esperar a q cambie a verde para utilizarlo? 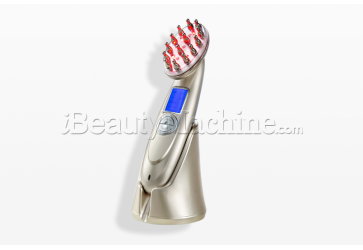 For the 3 in 1 laser hair restoration comb, it can not be used on your face, it can only be used on hair. *I PURCHASED 3 IN 1 LASER HAIR COMB 2 MONTHS AGO. ITS AMAZING. THIS COMB PROVIDES ACTUALLY MORE THAN 5 TECHNOLOGIES TO REGROW HAIR. THOSE ARE LASER, LED, MICROWAVE, MASSAGE, RADIO FREQUENCY, OZONE AND MICRO-CURRENT. SO ITS ACTUALLY 7 IN 1 TECHNOLOGY IN 1 COMB AND I AM GETTING THE RESULTS NOW. THIS IS THE ONLY LASER COMB WHICH COMBINES MOST ADVANCED HAIR REGROWTH TECHNOLOGIES INTO ONE COMB. I AM VERY HAPPY AND SATISFIED USING THIS PRODUCT. *It's very useful. after about 3 month treatment, a lot strong hair grow up. 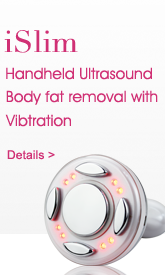 *Arrived very soon... Great quality product works great. Just like the one i used in the salon I was working in and I couldn't be more thrilled to now have my own, you can't beat this deal. My hair already have noticeable different after every application. *Works Great, I tell people about this comb all the time! have saw the result after two months treatment. *I used this comb for my bald patches and my hair is grown back. Excellent product. *I purchased this product recently and began using it. Am seeing new hairs in the front (the only part I can see clearly). So far, would definitely buy it again. *It now appears that I've regrown my hair. I had the occasion to bump into one of my physicians who asked if I had any hair plugs, etc. done since I saw him last. When I told him that I had not and I was religiously using your incredible comb, he was amazed, as he was very skeptical about the efficacy of such technology.